DAY FOUR ....... LOOKOUT DECK INSTALLATION GOING WELL. 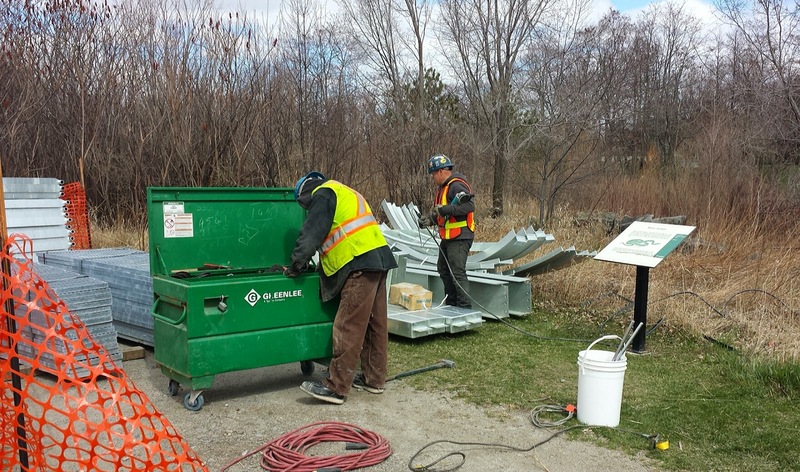 Today, they started work on the installation of the new observation deck in the large pond. We are told that the installation will take about one week. Jimmy Vincent from the Humber Arboretum Arboretum has just sent us an update about bookings for nature programs this May and June at Sam Smith Park. Approximately 1350 students are booked! 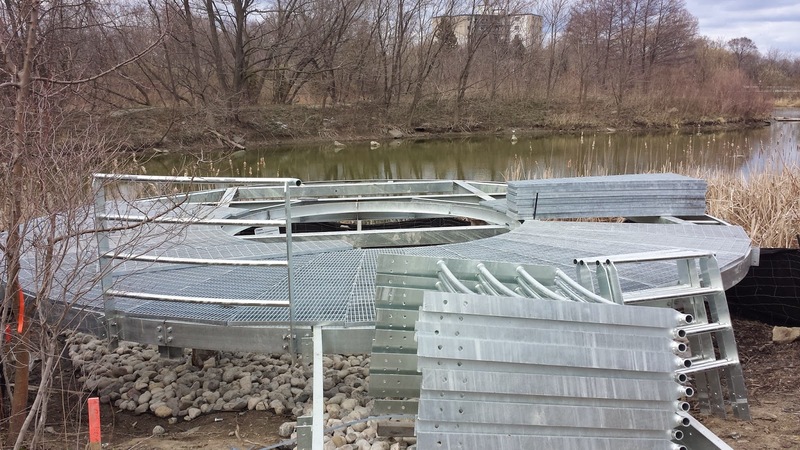 The new lookout will be finished just in time to be used as one of the outdoor "classrooms". Let's get them interested in nature while they're young! 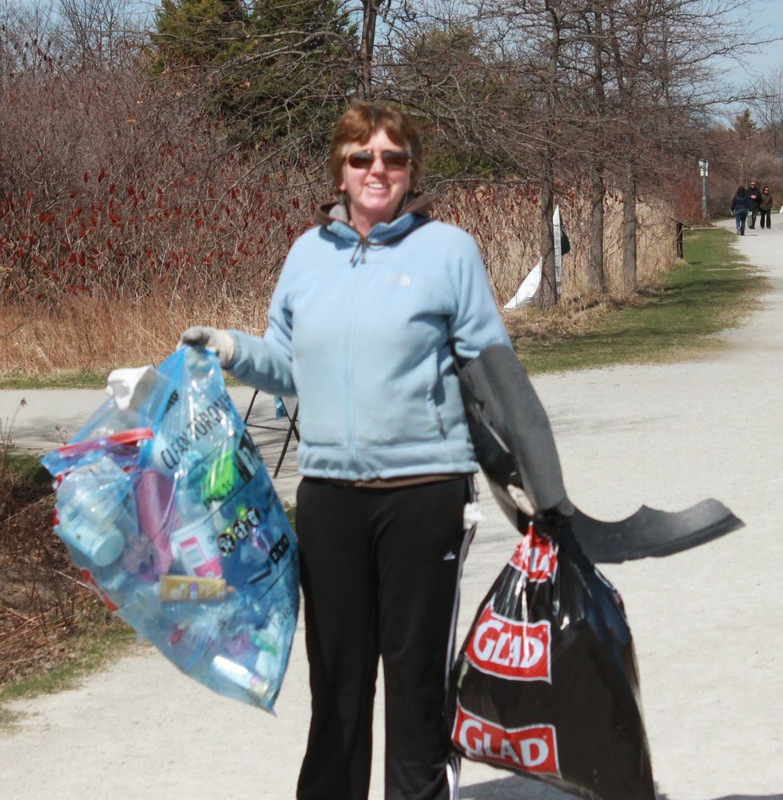 A very successful clean-up this year - the park is virtually spotless! One spot remains strewn with litter and that is the still wild area just north of Father John Redmond School. It has been suggested to the school's administration that students from the school might finish that area off. Congratulations to Alan Roy for pulling it off one more time and a heartfelt thanks to all the volunteers who turned out on a chilly, windy Sunday - especially the FOSS folk. 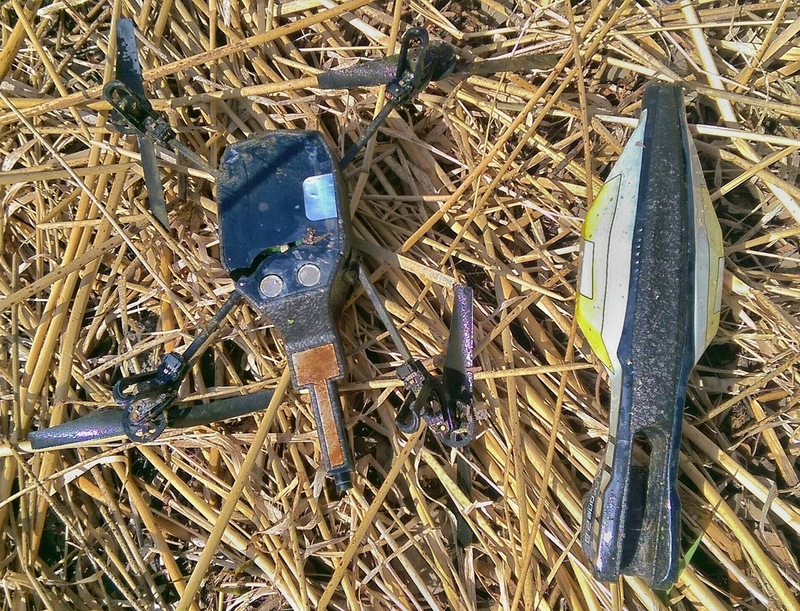 Best find this year goes again to Brian Bailey - in the large pond, a very broken "Parrot Drone Quadricopter" - $350 at Best Buy - OUCH!! A pair of fish was circling a gravel bed just off shore where the culvert enters the lake from the pond as if they were planning to lay eggs in the gravel. They look like they may be trout (Speckled?). Please email Friends of Sam Smith Park if you can shed light on this. Mark McAdam has solved the mystery ....... "They are Rainbow Trout. 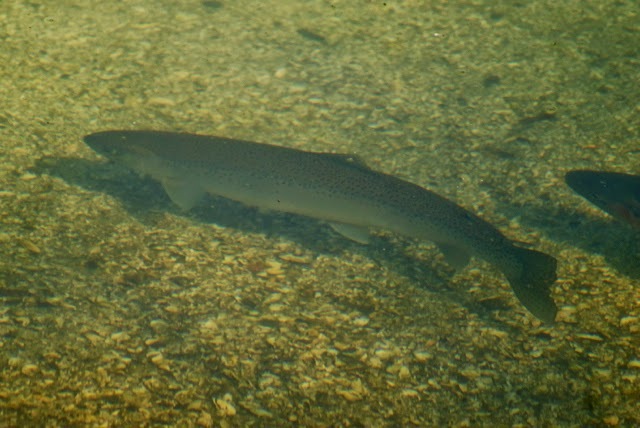 Any outflow (the culvert) or harbour will draw a few trout (outside of their natural river route) during the spring spawning run. They seem to get locked into these unproductive areas where they will still try to spawn." Toronto’s waterfront is a marvel in spring, and one of the best places to see the cycle of new life resume is at Colonel Samuel Smith Park at the foot of Kipling Ave. 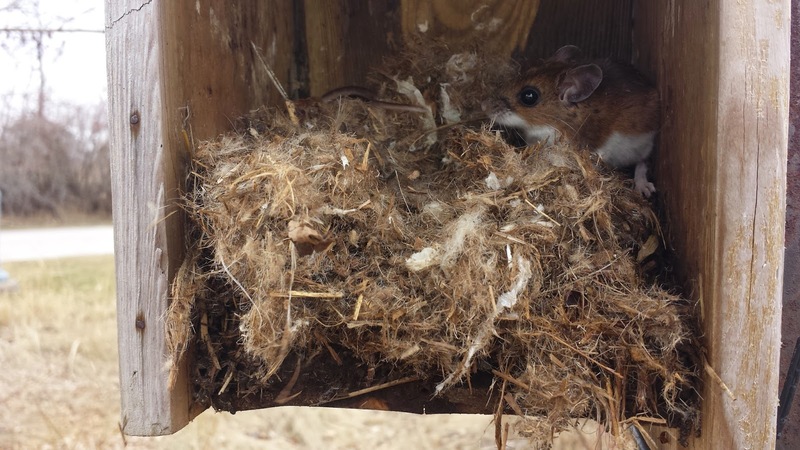 There, a building boom is underway: recently returned songbirds are busy constructing nests, mute swans are checking out building sites and a family of beavers is diligently expanding and refurbishing its lodge. But on a visit to this park on April 7, a day when the inner bay was still more than three-quarters covered with ice, it was the home-building efforts of a pair of red-necked grebes (Podiceps grisegena) that caught my attention. These grebes, medium-sized water birds that look like something Picasso might have created if he had crossed a common loon with a red-breasted merganser, have elaborate, elegant courtship displays I’ve written about before. But on this particular day, the pair I was watching had moved past courting and to the living together stage. Out in the bay, they were hard at work building a home for their future family, one carefully placed stick at a time. There was a rhythm to their construction efforts. Dive, return to the surface with a stick in their beaks, swim to the nest and delicately, with military precision, place it on the growing woodpile. There was only one problem: the two birds were building their nest on slushy ice at the very edge of the open water. A day or two of warmer spring temperatures would see the birds’ meticulously constructed home on the bottom of the lake and, with that, an inevitable delay in the race to reproduce. 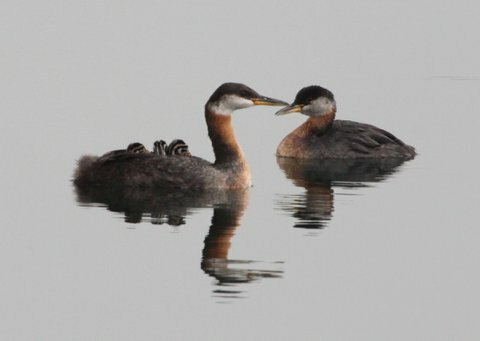 Grebes have been around for 40 million years. How could eons of evolution not have imbued them with an instinct to build their nest in a more appropriate place? Perhaps these grebes were not the most perspicacious Podiceps in the pond. Could they be contenders for the Darwin Award, avian edition? After some research into these questions back at home, I quickly learned that my judgment of this pair’s homemaking skills had been unduly harsh. Because their peculiar anatomy makes it difficult for them to walk on land, red-necked grebes normally build their nests in open water, where they essentially float, tethered to subaquatic vegetation. Perhaps the grebes at the park weren’t so dumb after all; their nest might simply float, anchored to plant life beneath the water’s surface. There was only one way to find out. I waited for a week of warmer temperatures to melt the ice covering the bay and then headed back to the park last week. It was a glorious day with spring’s fertile promise heard in the burbling song of the blackbirds in the marsh and smelled in the aroma of mud and the tang of lake water. Far out in the bay, long-tailed ducks yodelled and dozens of pairs of red-necked grebes whinnied, providing a contrapuntal top note to the scene. I made my way to the place where I had seen the grebe pair building their nest on the ice. I was hoping to see their raggedy construction floating on the water. But there was nary a stick or decaying leaf to be seen. It seemed the birds’ building efforts had been in vain. But all was not necessarily lost for this grebe pair. Pat Leonard at the Cornell Lab of Ornithology told me it’s not uncommon for floating grebe nests to be destroyed by wind or waves. He didn’t seem to be worried about a potential delay in the birds’ reproductive timetable, either. “There is enough lag time between their arrival on the breeding grounds and the laying of eggs to accommodate these events,” he explained. Leonard’s words came to me when I observed a grebe pair appearing to set up house only metres from where the ice nest had been. The birds seemed to be testing an old rubber tire for its fitness as a potential home site. I could see no plant matter sticking out of the tire, but perhaps it was there, just below my angle of view. I watched a long time as the two birds — one inside the tire and the other outside — interacted, vocalizing constantly and touching their beaks together. At one point, the bird on the inside, the female, I think, raised herself up almost vertically, shook vigorously, then settled back down into the hole of the tire. It looked like she was laying an egg. 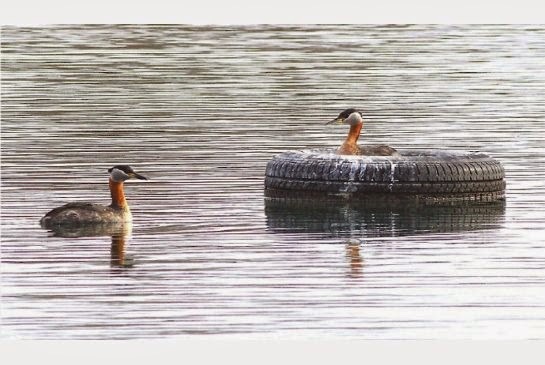 There’s no certainty, of course, that the tire grebes and the ice nest grebes were the same pair. But I have a strong feeling they were. Whatever the case, I wish them luck in the reproductive stakes ahead. I’ll be back in a few more weeks to see if I can catch a glimpse of their zebra-striped hatchlings. SATURDAY MAY 2, 2015 - SAM SMITH PARK BIRD HABITAT PLANTING - COME JOIN US! ARE THERE REALLY GHOSTS STILL HAUNTING THE OLD LAKESHORE ASYLUM GROUNDS? Now that the nice weather is here people are back to having fires in the park. The photo shows that once again trees from the park are being broken or cut down as they try to burn them. "In future I encourage park users to contact 911 immediately if they notice an open fire" (Jorge Ture - Park Supervisor). For ongoing complaints about the lack of regular police patrols, contact 311 (24/7), the local police at 22 Division (416-808-2200) and the Councillor's office (416-397-9273) so that multiple complaints may spur the police to patrol more often. It is also very important not to approach the problem directly. 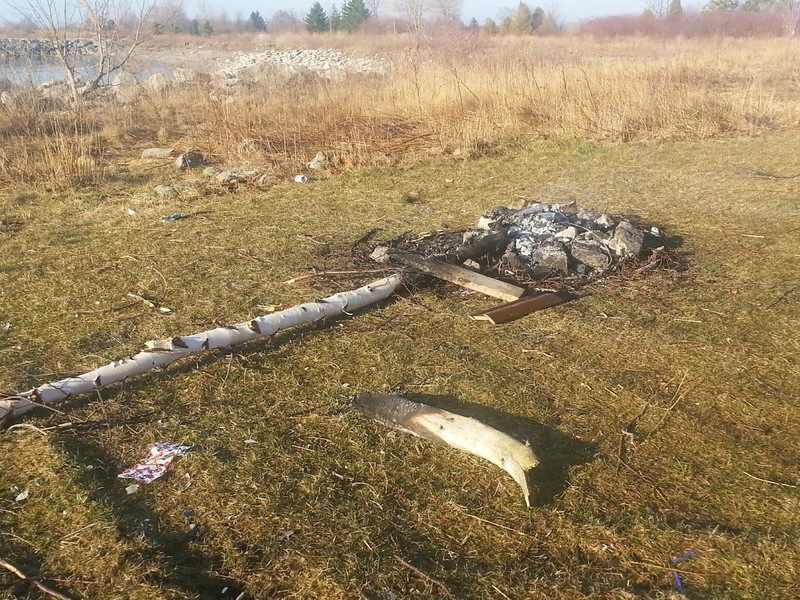 A few years ago a Friends of Sam Smith Park member was attacked when he approached a group of youth at a fire site and ended up being treated in hospital. "Thank you for bringing these concerns to Councillor Grimes. This is often an issue we face once the weather gets warmer. When an emergency situation arises, calling 911 immediately is the best route of action to take. 311 or 22 Division should be contacted for enforcement of non-emergency issues. Constable Michael Burgess is our Crime Prevention Officer, and works closely with the community regarding any issues residents feel are significant or recurring. Please feel free to reach out to him at 416-808-2251 with any questions or suggestions, particularly regarding public drinking." TREE SWALLOW BOXES NOW READY FOR NEW TENANTS! 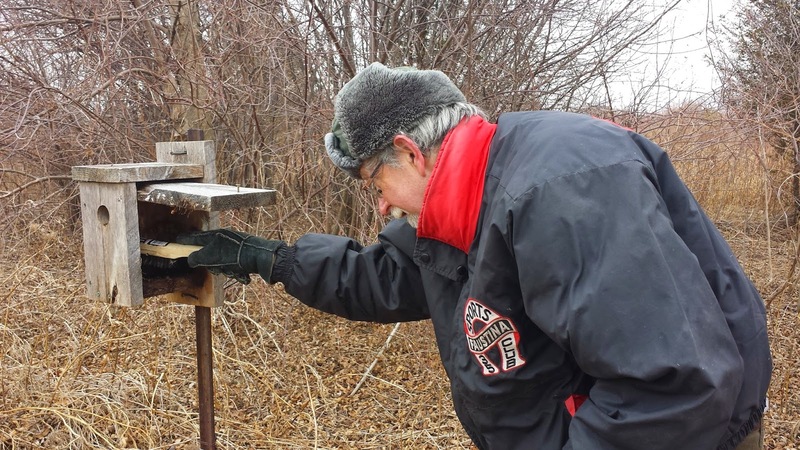 Friends of Sam Smith Park volunteer Bruce Wilkinson cleans out, repairs and sanitizes Tree Swallow Boxes this past weekend.... just in the nick of time! As soon as a box was made ready, pairs of swallows would swoop on the box and battle it out for possession. Within minutes, the box would be claimed. There are about forty boxes in the park at present, most of them beside the gravel path that runs through the "Swallow Field" (immediately east of the yacht club). Eight new boxes were installed this year. There would have been more but, unfortunately, there has been quite a lot of vandalism this year and some of the new boxes were used to replace those that had been stolen or broken. Unfortunately, we had to "evict" one rather bewildered field mouse from his winter home! HELP! VOLUNTEERS WANTED FOR SPRING BIRD FESTIVAL, MAY 23RD. Click on this link to go to E-birds (Colonel Samuel Smith Park) for up to date bird sightings. AMAZING MIGRATORY JOURNEY OF THE BLACPOLL WARBLER - LATE WOODLAND WARBLER THAT STOPS OVER IN SAM SMITH FOR REST AND FOOD. Tiny birds, even tinier backpacks, and a heck of a lot of air miles. Those are the essential ingredients behind a Canada-U.S. study that appears to have convincingly solved a 50-year-old mystery while at the same time discovering one of the most impressive animal migrations on Earth. The bird is the blackpoll warbler, a small but tuneful denizen of the boreal forest that can be found in summer months from Alaska to Newfoundland. The mystery has to do with how they get to South America every fall, where they overwinter. Now, with the help of some clever technology, scientists have the answer: The intrepid warblers take the direct route, flying across the Atlantic for up to 2,800 kilometres at a stretch. Researchers say the discovery is important not just because it is an ornithological record setter, but because it may indicate that habitat loss along their unconventional route or in their wintering grounds is the reason blackpolls are losing six per cent of their population each year. adult males of the species – is doing something unusual compared to songbirds of similar size. Like other warblers, blackpolls can be seen and heard moving northward every May, passing through the Eastern United States and Canada on their way to their northern breeding grounds. But come fall, it is a different story. Rather than retracing their spring route, the birds head east to New England and the Maritimes, where they devour enough insects to double their body weight in some cases. Eventually, the blackpolls reappear in Colombia, Venezuela and Brazil. Since the 1960s, researchers have speculated that blackpolls bulk up and make a straight shot across the Atlantic rather than take the longer, overland route. The idea was bolstered by stories of the birds showing up in Bermuda after storms or dropping in on ships at sea. But skepticism remained. No such migration over the open ocean had ever been demonstrated in birds so small. The first chance to do so came in 2013, with the arrival of geolocator devices that are small and light enough for warblers to carry in specially designed backpacks. Bulkier versions have been used in earlier studies to trace the migration routes of larger species. The devices can record only the passage of time and varying light levels from day to night. Yet, just like an 18th-century navigator equipped only with a ship’s clock and a sextant, the geolocaters use this information to compute latitude and longitude as an individual bird migrates. “As soon as these little backpacks became light enough, we were out putting them on blackpolls,” Dr. Norris said. 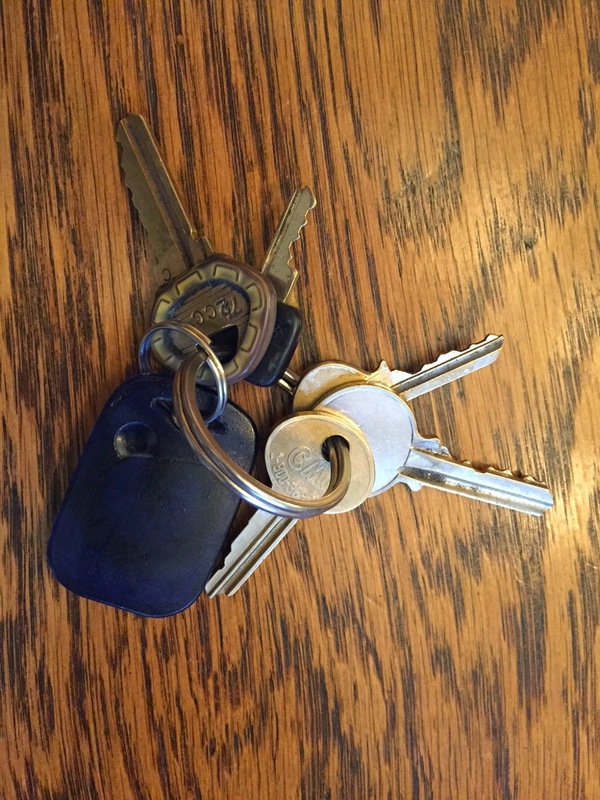 The catch is that the geolocaters are too small to transmit their data. Researchers have to recapture the blackpolls after they return the next season to find out where they have been, a task Dr. Norris compares to searching for a handful of flying needles in a forest-sized haystack. “The odds are somewhat daunting,” said Chris Rimmer, a conservation biologist and director of the Vermont Center for Ecostudies, which, unbeknownst to the Canadian team, was undertaking a similar experiment. The two groups learned of each other and pooled their results. Of the nearly 40 birds they had collectively outfitted with geolocators in 2013, five were retrieved the next year. It was only a handful, but enough to show clearly that blackpolls use an ocean route in the fall. One bird that Dr. Norris’ group released in Nova Scotia flew directly to Haiti, nearly 3,000 kilometres to the south. Other species are known to fly even farther, but as a ratio of body weight to distance, the blackpoll beats them all. Despite the risk of being so far from land, Dr. Norris said, the strategy has benefits, because it allows the warblers to avoid predators and it gets them to their wintering grounds faster. At some point, Dr. Norris speculates, there were probably two populations of blackpolls, but, over time, the ones that chose the Atlantic flight had a higher rate of survival than their land-leaning cousins. Dr. Stutchbury said she hoped the study would raise the profile of blackpoll warblers and lead to more concerted conservation efforts.